The master distiller for the recently revived Bladnoch distillery describes himself as a traditionalist, but, he tells Becky Paskin, that won’t stop him from drinking his whisky with milk. ‘I come from Stirlingshire from a village called Balfron – it was renowned as a hub of illicit distilling. One of my ancestors was actually imprisoned for being an illegal distiller. One of my other relatives was a distiller on Islay as well. It’s funny going back into the history books and finding it’s in your blood after all. ‘This year I’ll have been in industry 46 years. I’d started off in malt distilling at Glengoyne, then I moved into grain distilling in Glasgow at Port Dundas, which was very different. They then asked me to move down to London to assist in the commissioning of the gin stills at Wandsworth. It was a big step. They say you can take the boy out of Scotland but you can’t take Scotland out of the boy. ‘London in those days was totally different to what it is now. London was very much a distilling city; there were established businesses – big operations – that had been there for many years distilling gin. It was really weird because all the neutral sprit used to have to be distilled in Scotland. It was tankered down to us and we distilled it into gin, and then it was all tankered back up again and bottled in Scotland. Eventually they decided it was all pointless, to they moved the whole distillery up to Scotland and added it onto Cameronbridge. ‘In 1991 I took on the refurbishment of Deanston, which was a pretty run down place. Two years later Burn Stewart bought Tobermory on Mull and I refurbished that one as well, and then in 2003 they bought Bunnahabhain. It’s not the prettiest of distilleries but it’s got a lot of wonderful character about it. It was built like that [tall grey granite buildings] purely because it gets hammered with wind and rain. The nice thing about Bunnahabhain is it has wonderful warehouses that look out to the sea, which produce just wonderful whisky. ‘I know for a fact a cask’s location has an effect on the whisky. I’ve done a lot of testing on it. At Bunnahabhain I took a run of spirit and we sent half off to the mainland to mature and we left the other half at Bunnahabhain to mature for 10 years. The difference was quite noted – the drier spirit on the mainland hadn’t picked up any of the sweet saltiness of the one at Bunnahabhain. ‘If you measure the compounds in old Bunnahabhain casks you actually find sodium chlorate in it. The salt can only come from the briny atmosphere it’s breathing in. It’s a tiny amount, but when you measure whisky from the mainland there’s nothing. ‘Also, when you mature by the sea you lose less volume but you lose more strength because there’s dilution, and on the mainland it’s the exact opposite, your strength stays high but the volume goes down because the atmosphere is drier. So location definitely has an effect. 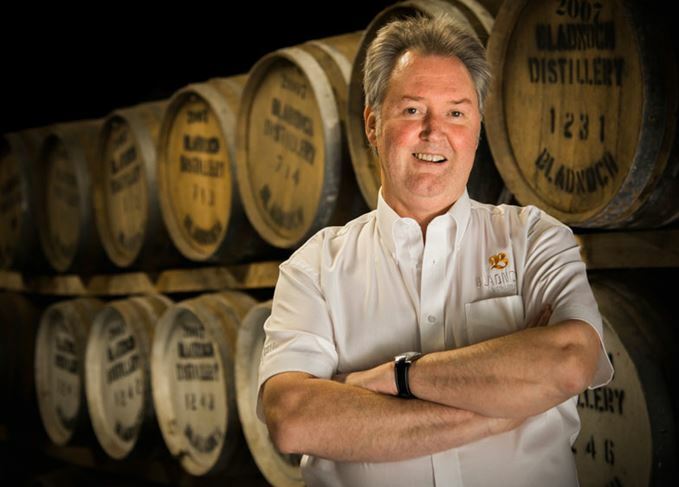 ‘I always thrive on a challenge and refurbishing Bladnoch was a major one for me. The location is idyllic; it’s beautiful. It’s a really traditional old distillery, and the original buildings are very little changed from what they were way back when they converted it in 1814-17. I went in and did a complete study of the site and realised it’s virtually just a scrap yard; there was very little I could salvage from it. ‘I wanted to go back to making what I would describe as a real traditional Lowland style, so I redesigned the shape of the stills to make the type of spirit I wanted. I knew the original Bladnoch spirit, I had samples of it, and it was very Lowland, but it lacked a couple of things. I wanted it to retain the grassy, linseed oil style but I also wanted to introduce more honey into it, as it was too dry, and a bit more fruitiness and weight. I also wanted to recreate what Bladnoch made from 1817 right up to the 1950s/’60s when they shut the kiln down, so we are making a heavily peated Bladnoch as well. ‘When you make a peated whisky the heavier phenols you want come over very late in the run – they prefer to be in a more watery environment – but you need a balance of that and not too much of the feinty element, so there’s a fine cutting point in there. I was stood by the safe for hours and hours to get that point where I thought it was right. ‘One of the first things I had to do when refurbishing the distillery was look at all the stocks that had been purchased as part of the deal. There were several thousand casks there we had to look at. I sampled pretty much every one, nosed and tasted and gave it a score, and it took me quite a few months to get through them all. I then took chunks and recasked them into new, better casks. ‘I’m a traditionalist – I believe whisky should be hand crafted. I’m not a big believer in automation, especially in malt distilling. Automation destroys the myth of what Scotch whisky is. It’s a handcrafted product. ‘We have two men on each shift at Bladnoch, a stillman and mashman, who’ve been trained. They’re not just doing their job – they understand why they’re doing it. You don’t get that understanding if you’re sat behind a panel opening and closing valves. If you’re manually involved and you know why you’re doing it that makes a big difference. ‘We always talk about three ingredients in whisky – malted barley, water and yeast, but the fourth one that’s equally important is the people who make it, and if you can instil that passion in the people who make it you get a good product, something people are proud of. You don’t get pride and passion from a computer. ‘The biggest misconception people have about whisky is that they’re drinking it wrong. I would never dictate to anybody how they should or shouldn’t drink whisky – there’s no wrong way; there’s only the way you drink it which is the right way. Some people are afraid of adding anything to it. My mother used to love whisky. She used to drink it with Irn Bru and I would never chastise her for that because she loved it like that. ‘I remember being in South Africa and being convinced to drink whisky with milk. A good measure of blended whisky, ice, and topped up with full fat milk – it has to be full fat. It’s really quite nice. It’s a lovely breakfast drink. We’re led to believe that non-chill-filtered whisky is somehow superior. But is it?